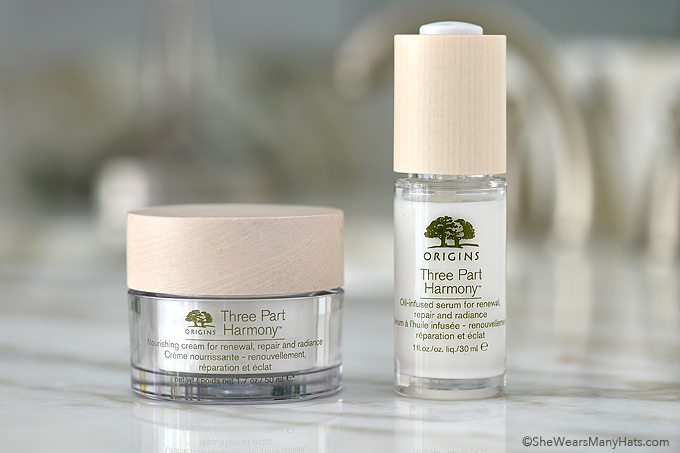 Renew, repair, and restore radiance with new Origins Three Part Harmony skincare. While I can go days on end without wearing make-up (okay, maybe a bit of mascara), I never go without moisturizer. As I’m nearing 50, dry skin has been a daily battle. Not only does dry skin look bad, I don’t like that way it makes my face feel. That’s why a good moisturizer is the first thing that goes on my face every day. It has become a splurge item in my beauty routine. So I was happy to hear from Origins about trying their new Three Part Harmony Serum and Three Part Harmony Nourishing Cream, designed to renew, repair, and restore radiance to create your most youthful and healthy skin. All of that sounds mighty good to me. Isn’t the packaging pretty? I am a girl who likes a pretty package. The Origins Three Part Harmony packaging is definitely pretty, simple and clean. But beauty is more about what’s on the inside, isn’t it? And what’s on the inside of these new products from Origins are natural, certified organic ingredients, like Tazetta Lily Bulbs, Vitamin E and Scutellaria, which help promote collagen, and nourish and brighten skin. What’s not inside the pretty packaging? Parabens, phthalates, propylene glycol, mineral oil, PABA as well as a few other ingredients I like to avoid when it comes to my skin and hair. How does this new Three Part Harmony duo perform? I’ve only been using the products for a couple of weeks now, and while I haven’t used them enough to share long-term results, I have already noticed how hydrating they are. So far so good. They are both immediately hydrating with a nice light citrus aroma. The Three Part Harmony oil-infused serum is packaged in a bottle with a handy dropper. It’s easy to spread and has a silky feel. Apply the serum first, and follow with the nourishing cream. The nourishing cream has a thick, rich consistency without being greasy. A little goes a long way, so I’m thinking it will last quite a while. 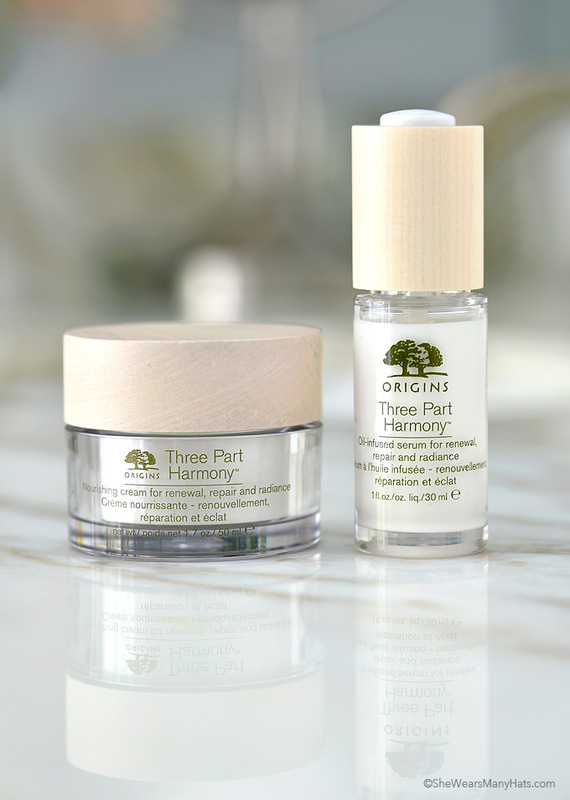 You can find out more about Origins products, as well as where to purchase the new Three Part Harmony Serum and Three Part Harmony Nourishing Cream over at Origins.com.